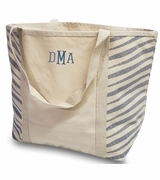 TEMPORARILY OUT OF STOCK...Monogram Ikat tote bag. Totes are all the rage and you probably have at least half a dozen! But now you need something different from the everyday offerings. Reminiscent of Indonesian craftsmen hand weaving traditional textiles, this stunning Ikat pattern is certain to be a conversation starter. The blue, black and white lines ebb and flow. Two solid black web handles offer a formal hand-carry option or a casual over-the-shoulder carry method. Use it for a day at the pool and pair it with a black and white day outfit for shopping. Monogram Ikat tote bag measures 20"W x 15"H x 7". Lined with small 4" x 6" attached accessory pouch, for ID and keys. Zipper closure. I bought this bag for my cousin as a graduation gift. The bag I bought her must have been discontinued or I bought the last one because I cannot find it anymore on the website but it is the exact same pattern as this bag. I love the design and the free embroidery. She loved the bag also. Very high quality bag for the price. These make great gifts because of the embroidery. Way less expensive than the other new bag websites out there today. Definitely will be buying from here again.